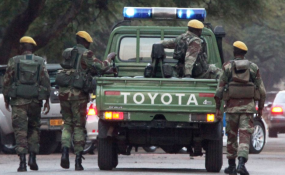 Scores of intelligence and police officers who were captured under the military's Operation Restore Legacy remain detained at unknown places as the army maintains its siege on the Zimbabwe Republic Police's Chikurubi Support Unit Camp in Harare, where the police armoury, snipers and paramilitary personnel are housed. The operation -- which saw the military storming some ministers' houses and besieging former president Robert Mugabe at his Blue Roof mansion in Borrowdale early this month, sparked a chain of events which eventually led to the veteran dictator's resignation on November 14. Several people, including former Home Affairs minister Ignatius Chombo, Central Intelligence Organisation director of security Albert Ngulube and Zanu PF secretary for youth Kudzanayi Chipanga were arrested and tortured during the operation. Armed soldiers also raided the homes of former Higher Education minister Jonathan Moyo and ex-Local Government minister Saviour Kasukuwere, where they fired shots randomly. Some people, among them, Harare South legislator Shadreck Mashayamombe, were seized and have not been heard from. Among the seized were police officers and intelligence officers. Although the operation was peaceful and has been scaled down, the military remains deployed around Chikurubi Support Unit base. The soldiers have pitched tents near the base. Army tanks have also been deployed. Tanks have been deployed at strategic points around Harare, including along Borrowdale Road close to the Air Force of Zimbabwe headquarters' main entrance. The military is also still present on the country's roads, although the Zimbabwe Defence Forces held a joint press conference, where they announced that police had resumed duties and would conduct joint patrols with members of the ZDF. Army spokesperson Overson Mugwisi said he did not know anything about detentions. He also refused to say when the operation would stop, saying: "We don't discuss national security issues over the phone or even in person." Copyright © 2017 Zimbabwe Independent. All rights reserved. Distributed by AllAfrica Global Media (allAfrica.com). To contact the copyright holder directly for corrections — or for permission to republish or make other authorized use of this material, click here.